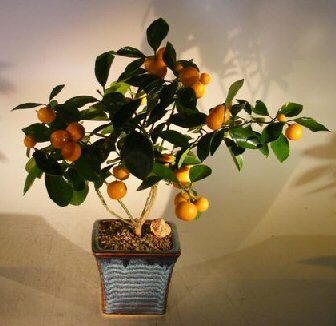 Our decorative Orange citrus tree has shiny evergreen leaves and marvelously fragrant white flowers. Miniature fruit (which grows only to the size of a golf ball) and flowers appear over the course of a year, often at the same time. Perfect in stir-fry, beverages or as a snack. Very easy indoor care. Flowering and fruiting indoor bonsai tree, grown and trained by Bonsai Boy. Shipped in a special 5" square, 4" deep 2 tone colored ceramic pot, as shown, to accommodate the deeper root structure of a citrus tree. Optional tray is CERAMIC and MATCHED to pot.